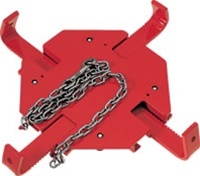 Same as 4 ton kits but for heavier jobs such as automotive frame straightening. "Quick-Lock" design for fast and easy assembly and disassembly. 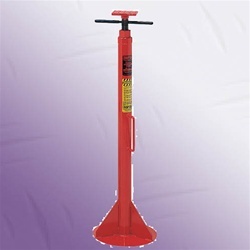 Long handle provides ease of pump. Thick walled extension tubes for added strength and longer life. 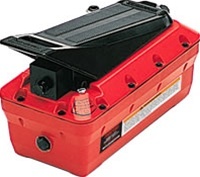 Roto-molded plastic case for organized component storage and ease of carrying. Flexible hydraulic hose with spring guards at both ends. Forged steel adapters for added strength and durability. 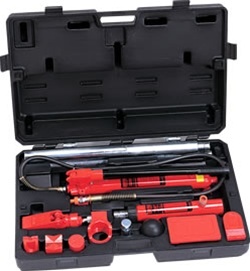 10 Ton Kit Includes: Wheeled Plastic Case, 10,000 PSI Pump, 6' Hose, 6" Stroke Ram, Wedge Ram (1/2 Ton Cap), 5",10",14" and 19" Extension Tubes, Tube Connectors, Serrated Saddle, Rubber Head, Wedge Head, 90 Degree "V" Base, Flat Base, Ram Toe, Plunger Toe. Be the first to review “NORCO 910005B 10 TON CAPACITY COLLISION/MAINTENANCE REPAIR KIT” Click here to cancel reply.